An interesting article in the Sloan Management Review discusses a paper that shows what you wear can influence how you perform. New research suggests that clothing can have an effect on our behavior if that clothing has a symbolic meaning and if we have the physical experience of wearing the clothes. In the first experiment, the researchers found that wearing a lab coat identified as a doctor’s coat did, in fact, increase subjects’ selective attention. In the second experiment, they found that people who wore the same coat but were told it was a painter’s coat did not have increased attention. And in the third experiment, they found that just looking at a doctor’s coat did not increase attention. Here is the link to the research paper. Does the compensation plan provide the right incentives? Incentives are key to driving R&D manager behavior. We have often discussed different approaches to improve financial incentives. A new article from McKinsey Quarterly has a unique take on how to evaluate compensations plans (Does the CEO compensation plan provide the right incentives?). The premise is that in addition to the remuneration for the current year, the accumulated wealth from the entire tenure drives executive behavior. Boards, shareholders, and journalists often look at a chief executive’s annual compensation plan to determine whether the company is offering the right incentives to increase shareholder value. But few consider another key question: how does the compensation that the CEO has already received over the years in the form of stock and stock options influence managerial decision making? The authors compared the median total annual compensation of chief executives and comparing it with their median total accumulated wealth. Their analysis shows that median accumulated wealth is nine times the year-to-year compensation for a CEO of a large company. Our research shows that for most CEOs in the United States, accumulated wealth effects are likely to swamp those of year-to-year compensation—meriting serious attention when boards evaluate how risk structures and incentives of executive pay packages align with the company’s strategy. We have discussed the inability to tie pay to executive performance (See Problem with Financial Incentives). We have also talked about longer vesting periods to better align performance with pay. This article gives a somewhat new perspective that longer vesting periods might actually have a negative impact because the accumulated wealth might start outweighing new compensation. Another unique perspective in the article is the convexity of the compensation package. If the compensation package is shares, the wealth change is linear with the stock price. Stock options on the other hand increase in value much more rapidly. If the CEO’s portfolio contains only shares, it will tend to rise and fall one-for-one with a change in stock price. We refer to this as “low convexity.” If, however, the CEO’s portfolio contains a large number of stock options, and especially multiple tranches of out-of-the-money stock options, the payoff curve can become quite steep (high convexity). Convex payoff structures such as these provide more financial incentives for CEOs to take on promising—albeit risky—investments because the CEO stands to earn very large rewards if successful. Hence, as we have discussed before, stock options encourage risk taking to get to the higher payoff. More risk taking may or may not be advantageous for the company and the board needs to be cognizant of its implications. The article does not address it, but we have discussed the inability of stock options to actually drive good behavior. So what is the overall recommendation? Understand the accumulated wealth effect before deciding on a compensation plan. This is especially pertinent for a longer term manager who is likely to have accumulated a large wealth. Decide whether you want more risk taking before granting stock options. Finally, benchmark with other companies and industries to decide the appropriate balance. Over the weekend I had a long discussion with a friend about Occupy Wall Street and what is wrong with our corporations. A few themes emerged that may actually be interesting for R&D management as well. It has been shown that executive remuneration has grown much faster than average worker. It is also felt that the pay is disproportionately large. A key problem with driving executive performance is the inability to tie pay to performance. Decisions made by executives have impact months (if not years) later. So, rewards based on current stock price do little to guide executive performance. Traditional approach has been to provide stock options that vest over a long period. However, stock options have shown to be ineffective in driving performance. This is mainly because the vesting of options does not have a direct relationship to the decisions made by the manager. Stock price in the future will depend on performance across multiple products. Furthermore, options will vest either with time, no matter what happens in the future. So, here is a proposal: Why not tie rewards to performance based on actual performance of new products developed by a set of executives? R&D executives are responsible for deciding which products to develop and how. The primary and largest reward could be a fraction of the profits generated by these products when they actually reach the market (True Profit Sharing). Most organizations develop (and maintain) a business case for pursing any new product. Hence the executive reward can be built directly into that business case. 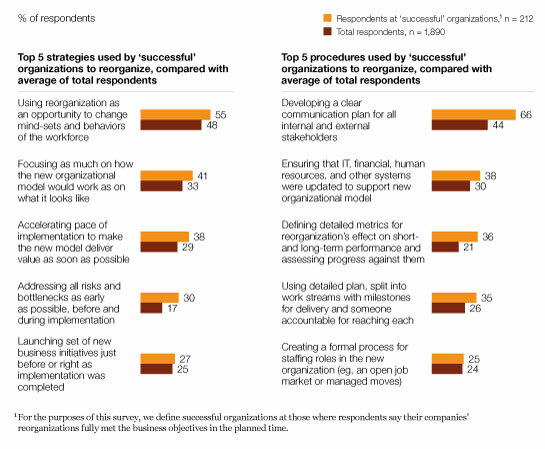 Boards of directors can monitor performance using the same business case. This approach ties rewards to actual decisions executives make on new product development. Organizations often redesign themselves to unlock latent value. They typically pay a great deal of attention to the form of the new design, but in our experience, much less to actually making the plan happen—even though only a successfully implemented redesign generates value. “Though a majority of respondents at publicly traded companies say their redesigns increased shareholder value, only a very small group of respondents—8 percent of those who have been through a redesign—say their efforts added value, were completed on time, and fully met their business objectives. 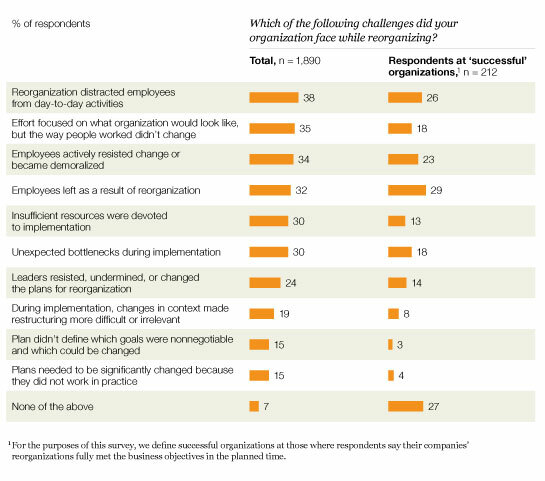 Here are some key takeaways: 1) Good reorgs take less than six months to implement; 2) they have clearly defined goals and objectives; 3) focus on how the new org would work (not just how it would look); 4) determine how the org cultures, processes, tools, roles and changed; and 5) leadership is fully engaged in change and not fighting it. Respondents are much likelier to say their organizations set broad goals than detailed ones for their redesigns (Exhibit 1). Notably, this is true even of redesigns that could have had very specific numeric goals.